The traditional advertising model is to use interrupting content to capture attention, but with the saturation of advertising and increasing ability of customers to ignore it, the question now is: ‘How do you become a part of the content?’ How do you weave into someones experience in a way that adds value rather than detracting from that experience? A business must be present when the customer wants them to be, not when the business wants to be. How can a business engage with people in a way that’s useful or helpful to their lives by exchanging value instead of just sending a message? A hyper-targeted, relevant, engaging content marketing strategy is the answer. 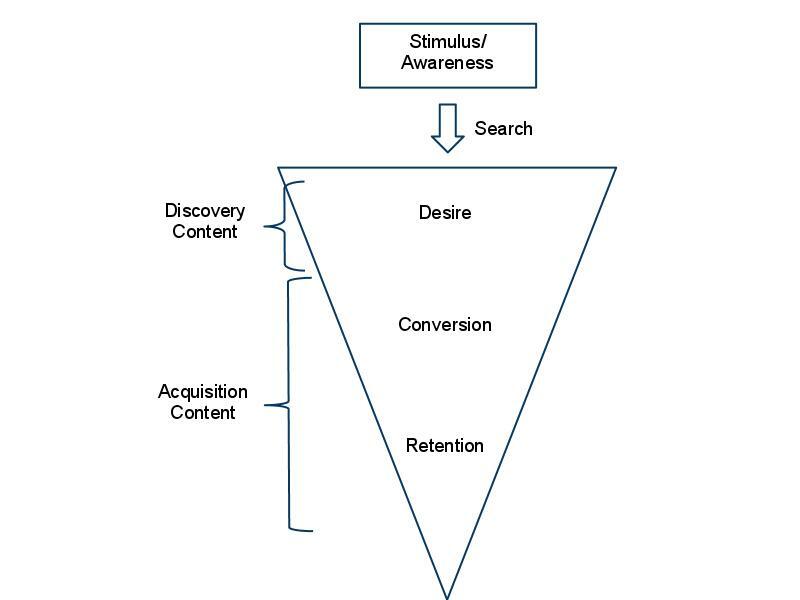 When starting up a content marketing strategy I think the content can be segmented into two kinds of content: discovery content and acquisition content. This content is used post-stimulus: after the user sees a commercial on TV, a friend mentions something to them or a need is discovered – like the wheels on the car are starting to get bare. It’s the online pre-shopping research that, according to a study by Google, 84% of shoppers now do before deciding to buy. The main objective of discovery content is to allow the business to be found when people initiate this pre-shopping behavior. Its the content that comes up in organic search results when people ask questions like: “best (your category here)”, “(your category here) reviews”, how to, where to find, etc. What life situations happen that would arouse a new need in your customer’s life? They are now in the market for what you sell because _____ happened. Make content that helps them solve that need that just appeared. The old product has worn out, they’re going on vacation, they’re used it up, getting married, graduating from school, got in an accident, etc. Mediums include: product demo videos on Youtube, staff picks on your site, blogs posts that answer questions/explain how to, Facebook status updates that promote good reviews. This content is where the marketer comes in and creates compelling creative that holds the person’s attention and adds credibility along the path to conversion. Content that builds interest, desire and trust. Beautiful photography, good design, going behind the scenes, personalized/optimized landing pages, replying to questions, aspirational stories, relevant curation and filtered recommendations. This is the content that fills news feeds, email subscription lists, rss feeds, twitter streams and the stuff that gets shared. You meet the customer post-stimulus with discovery content and then you date a while with acquisition content in the hopes of someday getting married at the sale. No one gets married the first time they meet or on a first date, it’s a process that takes time and trust. And then after marriage you work to have a happy one.